I would like it to be mandatory for manufacturers to put information specs in how electrical is to be connected if they choose not to provide box lug connectors. There is a restriction by the component manufacturer as to wire size that is allowed for a binding head terminal. 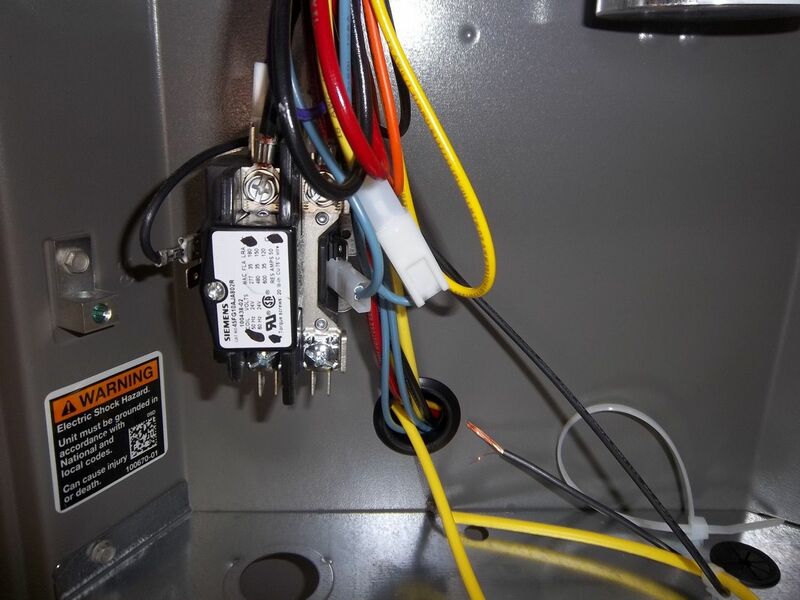 HVAC Equipment manufacturer instructions have one reference the NEC for electrical connections. 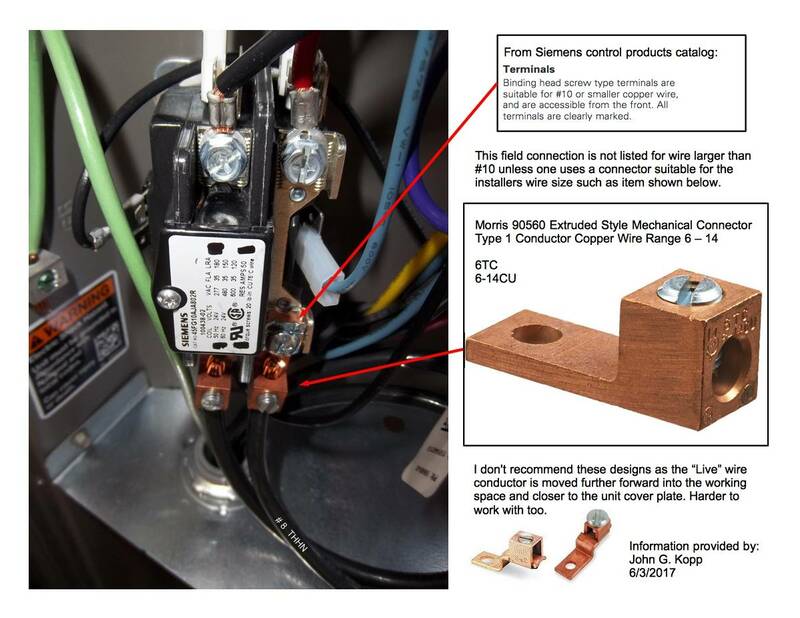 The photo I attached showing #8 THHN wire is not approved by the component manufacturer. Last edited by Jgkopp; 06-06-17 at 01:58 PM. generally UL requires this information be included in the instructions. This illustrates how we hook up larger than #10 wire to these terminals. Its not, and I agree it should be required when larger conductors may be in use. The question is why is a #8 being used on those terminals. Is that the required size or is someone oversizing the circuit? The manufacturer needs to have a terminal sized for the wires needed for their unit. If it is not then letters and phone calls need to be made to the mfgr. This same component is used by manufacturer [Lennox Ind. & their subsidiaries] on residential HVAC Equipment 1 - 5 ton. 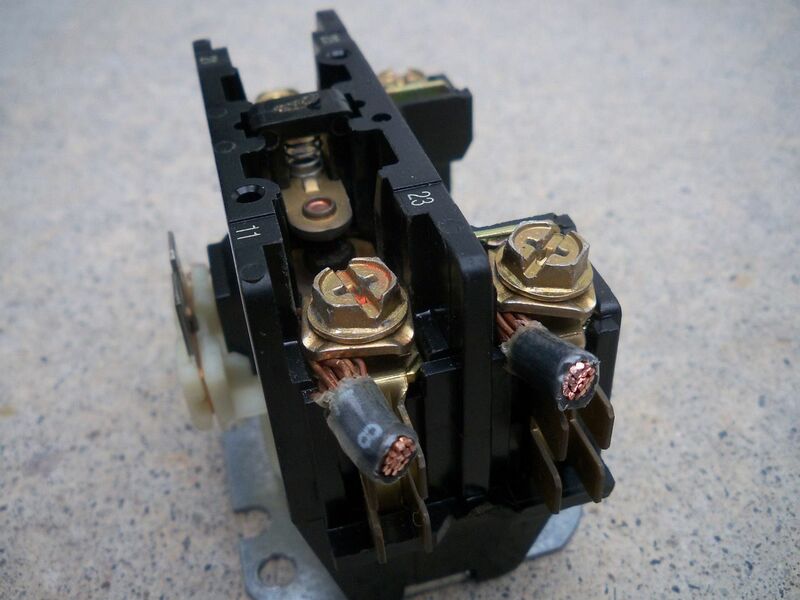 Other manufacturers provide box lug on field hook up side of contactors. I have been harping on this subject with said manufacturer for years with no results. Looks like I have finally found a place to post my story. There are 100's of thousands of units not correctly connected. the thing is that the terminal is labeled in some way with the largest size wire that is allowed. I don't know what more you expect of the manufacturer. why do you want to use a larger wire than the terminal is rated for? what if the terminal is only rated for #10 and someone decides to use 1/0? if that were to happen it is the installers responsibility to figure out how to do it. it is not real hard to splice a #10 conductor to the end of the 1/0 conductor so the #10 can than be connected to the terminal. The componet is not labeled with this information. I had to do a lot of digging to get this information. But at least it is in the product catalog, even if few will read it there.